To add an extra amount to a customer's invoice for such things as gift wrapping, you can create an item, mark it to not track inventory deductions, and decide whether or not to set a fixed price. From the Shortcuts form, click Create New Product (or from the Product List tool bar click ). 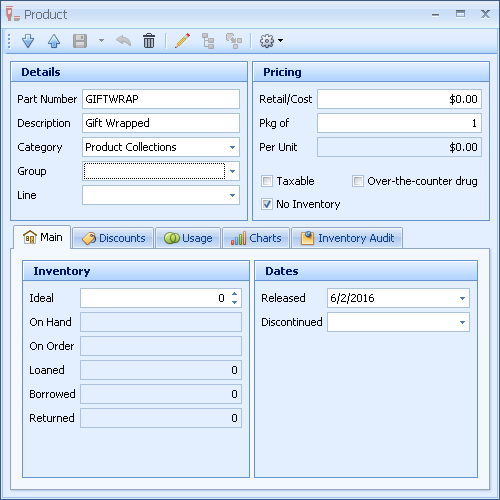 Assign the item a Part number and give it a Description. In the example used above, to create a gift wrapping line item, you could enter GIFTWRAP for the part number and Gift Wrapped for the description. From the Category list drop-down, choose the category where you want the item located (We recommend Product Collections or a different section 1 category). Leave the Group field blank as it does not apply. In the Retail/Cost field, enter an amount if you charge a set amount, otherwise leave it with a zero value to add the amount at the time of sale, directly to the invoice. Select the No Inventory check box to mark the item for no inventory tracking. From the Product Profile tool bar click . ֍ Who Are My Skincare Customers?